the deadliest industrial disaster in the history of the city of New York and resulted in the fourth highest loss of life from an industrial accident in U.S. history. The fire caused the deaths of 146 garment workers, who either died from the fire or jumped to their deaths. Most of the victims were recent Jewish and Italian immigrant women; the youngest were two fourteen-year-old girls. Many of the workers could not escape the burning building because the managers had locked the doors to the stairwells and exits. People jumped from the eighth, ninth, and tenth floors. The fire led to legislation requiring improved factory safety standards and helped spur the growth of the International Ladies’ Garment Workers’ Union, which fought for better working conditions for sweatshop workers. There have been many commemorations, including a reading of the names of the women who died that day. It is bitterly ironic that Maine governor Paul LePage chose this week to order “the removal of a 36-foot mural depicting Maine’s labor history from the lobby of the [state’s] Department of Labor.” Why? According to LePage spokesman Dan Demeritt, the administration felt the mural and the conference room monikers showed “one-sided decor” not in keeping with the department’s pro-business goals. “The message from state agencies needs to be balanced,” said Demeritt, adding that the mural had sparked complaints from “some business owners” who complained it was hostile to business. mural was erected in 2008 following a jury selection by the Maine Arts Commission and a $60,000 federal grant. Judy Taylor, the artist from Seal Cove, said Tuesday that her piece was never meant to be political, simply a depiction of Maine’s labor history. 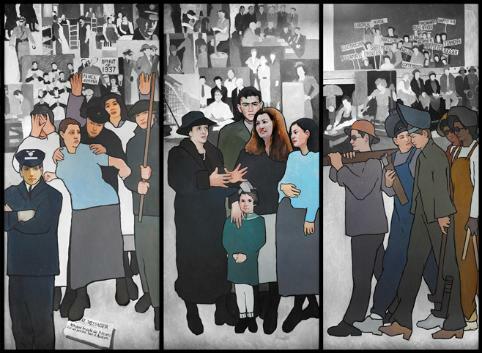 The 11-panel piece depicts several moments, including the 1937 shoe mill strike in Auburn and Lewiston, “Rosie the Riveter” at Bath Iron Works, and the paper mill workers’ strike of 1986 in Jay. According to Taylor, the idea for the panels came from Charley Scontras, a labor historian at the University of Maine. Taylor said she’d never heard that her mural painted an unflattering picture of business. She said people had always reacted positively to the mural, even businesspeople who came to her studio. The 1937 Strike : Scenes from an unsuccessful strike attempt to create better conditions for women workers. Francis Perkins : FDR’s Labor Secretary, and untiring labor activist, a Maine Labor icon. Rosie the Riveter : Maine’s version of WWII women workers participated as ship-builders. Be sure to visit Taylor’s site and examine the other panels. Is it not enough in this great recession for millions of working Americans to suffer? Must the history of labor be whitewashed? Must being pro-business mean turning a blind eye to the workers who make business function? What madness!